Our golf course features mature tree-lined fairways, sculpted landing areas and well-protected, undulating greens. Water hazards come into play on five holes. Our signature hole is Number 4 (135 yards, par 3), which requires a tee shot over Rattlesnake Creek onto the green. Spectacular views and elevation changes make for an exciting round of golf. Summer Kick Off.... our outside bar and dining areas are open. Enjoy a meal or just a drink as you take in the surroundings of our beautiful course and countryside. Please call 814-265-1435 for current rates. 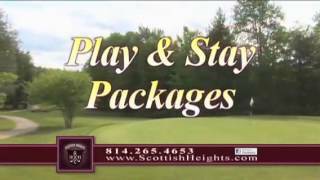 From I80 take exit 97 Brockway PA exit follow signs for Scottish Heights Golf Club and Lodge. Take a right on Rattlesnake Road Scottish Height Drive is on left. From 219 North (Buffalo) follow 219 South to Brockway see Scottish Heights sign take a left on Keystone Road. Scottish Heights drive on left. Call 814-265-1435 for rates and tee times. Contact Scottish Heights Golf Club at 814-265-1435 for more information and details on holding a golf outing at the course. On site we offer clean comfortable rooms, condo, or golf lodge. Our Golf Lodge features 2 large bedrooms with 2 double beds in each, 2 full size bathrooms, and a sitting area with small refrigerator, microwave, TV and a pull out couch. Onsite, all golf packages include meals. This profile was last updated on 05/22/2017 and has been viewed 4,495 times.